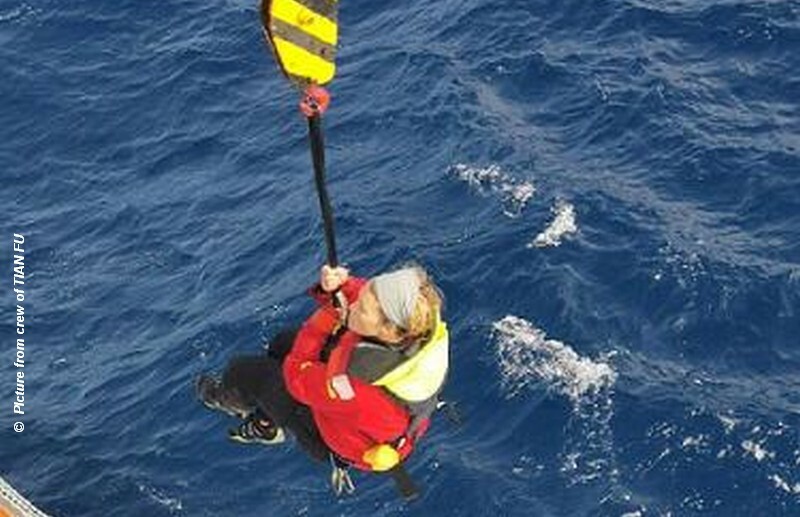 The crew of the Hong Kong registered cargo ship MV Tian Fu has successfully rescued British yachtswoman Susie Goodall from her dismasted yacht 2,000 miles west of Cape Horn. Susie Goodall Racing lifted off the hulk of her yacht on the crane hook of the TIAN FU and headed for that long awaited CUP OF TEA!! So good! thanks to all involved . . . a very professional effort. Goodall (29) from Falmouth UK was the sole women and youngest skipper competing in the Golden Globe solo non-stop round the world race. She was lying in 4th place and challenging for a podium finish when her 36ft yacht was pitch poled and dismasted during a ferocious storm. Sheltering below at the time, she was thrown across the cabin and knocked unconscious. Only when she came to, did she fully realise the situation. Inside was flooded and totally trashed with the contents of lockers and draws strewn across the cabin. On deck, DHL Starlight’s rig and two spinnaker poles that she had planned to utilise as a jury rig in the event of a dismasting, had been swept away. The first the world knew of her situation was at 10:30 UTC Wednesday 5 December when HM Coastguard’s MCC (Mission Control Centre) in Fareham UK picked up an EPIRB distress alert from the yacht. This started a tense 50 hour international rescue operation involving British and Chilean rescue authorities and an all-ships alert. The first ship to answer the Chilean Coastguard alert was the bulk carrier MV Talimen 480 miles south west of Goodall’s position, which diverted course, but later the 38,000 ton Hong Kong registered cargo ship MV Tian Fu, 80 miles closer, was tasked with the making the rescue.